Here comes a wave of thrill! Are you prepared for it? Chilli Heat Slot by Pragmatic Play is squeezed with spicy features and incredible symbols that will release hair-raising effects on you. But don’t worry, the piquancy of these deluxe features will not harm you in any way. Go mouthful and collect your seasonal symbols for unrivalled levels of fun. That’s because the symbols of Chilli Heat Slot help to generate wins and even features! So, ready to go for the chillies? Chilli Heat Slot is playable on any mobile, tablet or desktop device. Once you access the game, you will be able to dive into the fun! Chilli Heat Slot allows you to set the bets of your choice. Those who are comfortable with their bets can click onto the spin button to give the slot a go! 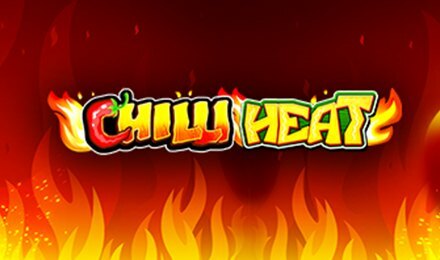 On Chilli Heat Slot, you are awarded wins when you land three or more matching symbols along a pay line. Of course, features are here to help you generate more winnings. Care to give it a try? Bet Levels: Chilli Heat Slot does not offer any bet levels. You can only choose the number of coins that you play per round. From 1 to 10 coins can be selected. Amount of Paylines Selection: Here come the lines! There are 25 of these and they are all active throughout the gameplay of Chilli Heat Slot. Coin Values: Feel free to choose your desired coin values on Chilli Heat Slot. The game proposes a minimum of 0.01 up to a maximum of 0.50. You can adjust these values by clicking onto the plus and minus buttons available next to the spin button. The Chilli Heat Logo stands for the Wild Symbol of the game. And just like other Wild Symbols, it can act as a substitution for any other symbols of the game bar the Scatter symbol. Talking about Scatters, the Sun Symbol stands for the Scatter Symbol of Chilli Heat. No wonder, the heat is extreme in here! The Sun Symbol helps in the activation of the Free Spins Feature. You can land the Money Bag Symbol at random on the reels of Chilli Heat Slot. All Money Bag Symbols carry a certain number onto them. If you obtain six Money Bag Symbols, you are granted 3 re-spins. All symbols are removed from the reels except for the Money Bags, which are locked. Each time you obtain a Money Bag Symbol, it will be locked in place again and the re-spins reset. In the end, if all re-spins are used up or the reels are filled with Money Bags Symbols, the feature ends. The prize displayed on each money bag is culminated and awarded to the player. Hmmm… what is missing here? Oh yes… a Good luck wish! Good luck to you, fella!